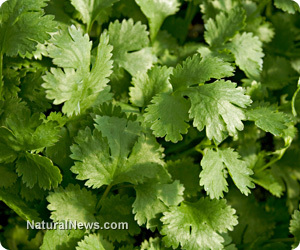 (NaturalNews) Cilantro is far from just being an herb used for side dishes in Mexican food. Even though this herb takes on the appearance of parsley, it does not taste like it at all. With that in mind, because it looks so much like parsley, it is important to keep your herbs properly marked. Cilantro is best known for how well it detoxifies the human body. Dr. Edward Group, CEO of Global Healing Center, states that "cilantro is most often cited as being effective for toxic metal cleansing and rightfully so, this herb is a powerful, natural cleansing agent. The chemical compounds in cilantro bind to toxic metals and loosen them from the tissue." This does not mean that we should not err on the side of caution, though, and consult with our primary care physician regarding detoxing. Once toxins become mobilized, the elimination process must be quick in order to prevent physical harm. Juicing from cilantro, at least six cups, is highly recommended every week. It is not recommended, of course, that this be done all at once. Begin by adding two cups of cilantro juice in with your regular juicing routine at least three times per week. It is optimal if you are already using a dark leafy juice blend of spinach and parsley in your juicing routine. If you have an aversion to the taste of cilantro, you can help mitigate the taste through use of properly juicing with greens. There are a number of nutritional benefits to cilantro. There is an unusual array of antioxidants and phytonutrients found in cilantro, which are both rich in healing properties such as being antiseptic, fungicidal, aphrodisiac, analgesic, having digestive properties and being a natural stimulant. When cilantro is juiced raw, it is in its most powerful form. Even though cilantro only has traces of vitamin B, it is a very good source of vitamins K and A, and C vitamins. Cilantro is also a good source of potassium, calcium, manganese, iron and sodium. It is important, especially in these days, to keep the body rich in minerals. Cilantro helps heal the body in many ways. It is an anxiety reducer. The small intestine reacts well to cilantro, and it helps with eliminating waste in a healthy manner. Helps with macular degeneration, red eyes and eye disorders. Helps stave off infections and urinary tract infections. Vitamin K plays the strongest roles in bone health, and cilantro is richest in this vitamin. Helps prevent anemia by building up blood supplies. The stems are rich in antioxidants such as quercetin, kaempferol, rhamnetin and epigenin. When juiced and consumed as part of a regular routine, cilantro is known to help reduce the amount of damaged fats found in cell membranes.